I’ve given up meat for Lent. All meat, including fish (and yes, fish are meat, contrary to popular, and frequently outraged opinion). Now I like meat. I like the defiantly savoury flavour of chargrilled skin, and the tender wobble of slow-cooked fat, and yes, I actively enjoy mopping up blood with a rustling pile of hot frites. All of which, I realise, reading back, makes me sound vaguely fetishistic. What I mean to say is that I’m not going to find the next 40 flesh-free days easy. So why, you might sensibly ask, am I doing it? Not because I think anyone up there wants me to, or because I’m hoping to cut down long-term (in fact, thinking about it, I’m surprised how little meat I consume on a day-to-day basis), but because I hope that the challenge might make me into a more inventive cook. I also, two days in, find the idea quite exciting; an excuse (and life being as it is, excuses are sometimes necessary) to try new dishes and experiment with ingredients. (Judging by the world’s major religions, humanity thrives on dietary restriction.) Also, I’ve tried this before, a couple of years ago, before being invited to South Africa to drink wine for a week. That didn’t work out well, and I’ve felt vaguely cross with myself ever since, despite not being able to regret that steak at Cape Town’s Saturday market, or the pinotage burger at Beyerskloof or much else, to be honest. My original plan was to kick off as I meant to go on with some south Indian dosa for pancake day, but, after falling off my bike twice in rush hour traffic, that didn’t happen. Last night, I went out, but dined on wine. So, although I have to keep reminding myself that sushi is out of bounds, and the gurnard on offer from the test kitchen at the food magazine where I’m currently working is not for me (Jonathan Safran Foer has some interesting thoughts on the subject of why we fail to engage with fish in the same way as land animals in his book, Eating Animals, which I’m slowly ploughing my way through), I haven’t had a chance to really come to terms with my newly vegetarian state yet. Tonight is the night. 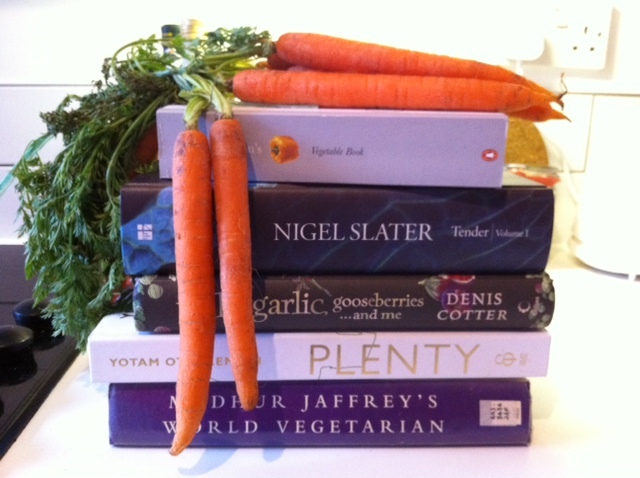 The picture above is of the pile of cookbooks I’ve initially earmarked as my guides in this strange new world – with old friends like Nigel, Yotam, Jane and Madhur at my side, I must say I’m feeling pretty confident (Denis is a new one on me: despite having had the book since eating at his Cork restaurant about three years ago, I’ve not yet found the opportunity to cook anything for it. One more reason for excitement). Blogging about it is an attempt to ensure I don’t quietly fall off the wagon. Even if I happen to encounter the meat wagon itself. belly of pork. I don’t think that requires further explanation. ox cheek, pulled pork and anything else slow-cooked and unctuous. sausages. Haven’t eaten one for what seems like ages (now I remember! ), but yesterday someone here mentioned a Waitrose fennel seed number I’m now obsessing over. black pudding. I eat this even less often than sausages, but I could easily have it every weekend. Preferably Clonakilty. smoked fish, particularly mackerel. And Gentleman’s Relish on toast. There, now I’m thinking about anchovies again. Felicity, good job on the blog. Always nice to see new ones emerge. The vegetarian option by Simon Hopkinson has some interesting and exciting meat free recipes. Although I seem to remember one of them included bacon… maybe it was a typo. You write so beautifully- it’s fantastic to find it in another home. Hurrah for the blog. Good luck with lent- we’ve been doing ‘meat free monday’s for a while now -I quickly discovered that pulses were my very special friends. Though to me, lentil soup doesn’t taste nearly as good without the ham hock. There is a recipe that my Sweetheart found that is aesmowe. From Vegetarian Pleasures by Jeanne Lemlin called Pate de Legumes with lentils and green beans. Even as a meat eater I love this one. -3Was this answer helpful?